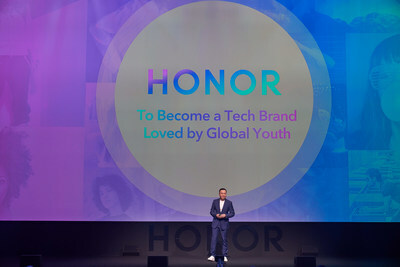 PARIS, Jan. 22, 2019 /PRNewswire/ -- HONOR, a leading smartphone e-brand, officially announced the HONOR brand upgrade today at the HONOR View20 Global Launch in Paris. The upgrade reveals a new logo, a new slogan of "HONOR MY WORLD" and all-new brand partnerships with MOSCHINO, VIVIENNE TAM and Fortnite. "HONOR's strong business performance in 2018 saw a 170% YoY increase in our overseas markets. This has brought us closer to our goal of becoming a 'Top 5' global smartphone brand within three years. We aim to become a tech brand loved by global youth. To better meet young people's needs of technology, design, personal expression and community engagement, we upgrade our brand. This new branding will mark the next step in our global business growth," said Mr. George Zhao, President of HONOR. It is during CES 2018 that HONOR firstly mentioned the goal of becoming a 'Top 5' global smartphone brand within three years. In the very first year of HONOR expansion to overseas markets, this goal has already been achieved in many countries. According to the latest GfK report, HONOR maintains a "Top 2" brand in Russia, and becomes a "Top 4" brand in Italy, Germany, Finland, Saudi Arabia, UAE, Ukraine, and a "Top 5" brand in France, UK and Czech Republic. According to research by the World Youth Congress & Disrupt Creative, 52% of young people describe themselves as a global citizen and 65% favor sharing over ownership. Young people ask for more personal expression and community interaction than before. In respect of these values, HONOR builds a big HONOR community to connect and highly engaged with global youth. HONOR's 21 Fans Clubs all around the world held more than 200 Fan Events in 2018. So far, the number of registered HONOR fans has exceeded 120 million, an unimaginable number for such a young brand. To keep up with the international aesthetic trend, HONOR has introduced a new logo, upgrading to capital letters "HONOR" and adding moving color. The concept of moving color represents the warmth and bright sides of technology and the diversity of the youth culture. This creative design enables HONOR to converge aesthetic theory and cutting-edge technology to develop more stylish products for the global youth. HONOR is committed to offering breakthrough technology and design, an intelligent and personalized user experience, a stylish all-scenario digital lifestyle to youth across the globe and to setting trends of pioneer culture and modern life style. In line with the new slogan, "HONOR MY WORLD", HONOR encourages young people all around the world to take action and enjoy every moment of their life. HONOR has also started a collaboration with Vivienne Tam, an international fashion designer. By introducing VIVIENNE TAM's design philosophy to HONOR products, HONOR is demonstrating its transformation into a trendy tech brand.